Olay Total Effects 7-in-1 Anti-Aging Eye Treatment is a daily all-in-one eye cream treatment with a proven vitamin-rich complex fights the 7 signs of aging around the eyes for youthful vibrancy. The Total Effects 7-in-1 Anti-Aging Eye Treatment instantly hydrates to reduce the appearance of fine lines and crow’s feet, dark circles, dullness, uneven tone, texture and puffiness when massaged around the eye area. Dermatologically tested, oil-free, and fast-absorbing, this treatment replenishes moisture to reveal healthier-looking skin. 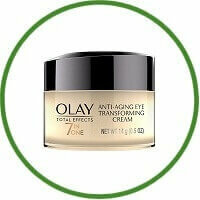 See the difference for yourself with Olay Total Effects 7-in-1 Anti-Aging Eye Treatment. For those concerned about accelerated age signs around the eyes like dark circles, crow’s feet and creases, this gentle anti-aging cream provides 7 transforming therapies in 1 essential eye product. Line Minimization: Reduces the appearance of fine wrinkles. Lightening: Reduces the appearance of dark circles. Brightening: Improves dullness, reducing puffiness. Moisture Nourishment: For firmer appearance and suppleness. Gentle Smoothing: Renews skin texture. Tone Enhancement: Reduces appearance of blotchiness. Visibly younger-looking skin above and around the eyes: It’s designed for the skin around the eyes to deliver moisture with a complex of vitamins and minerals, cucumber extract and aloe Vera.